The first Female Champion of Change... is it time I step up? "I hope that there comes a day when there is no gender equality issue. I was recently asked at a university event what I am doing for the males in the legal profession. I commented that when they are the only male walking into the Supreme Court applications lists to a room full of females barristers, when they are struggling to find a way to feed their newborn through a two week trial without having to openly state in Court the reason for afternoon recess, when they are spending nights wondering if they should be giving the President's Address they really want to give as opposed to the Address that should give so as not to cause controversy at their Annual Male in Law Dinner, then I will gladly step up, advocate for them and be the first female champion of change." The day has come where there has been questions raised from the males on the 68% majority representation of females on a Board. A Parole Board in Queensland that has a committee to review applications and make recommendations on appointment based on criteria, that is, merit. I haven't read through the ins and outs on who is on the Board and all those finer details. Not relevant to me for this purpose. Now, I stress from the outset. This is not a blog about politics, about who made the comments, what party they are from, or who has been appointed. Again, not relevant. This is a blog about my previous commitment (given on no less than two occasions) to step up and be the first Female Champion of Change. The above quote is taken from my President's Address at the 2016 WLAQ Annual Awards Dinner. I am now fully aware of a situation where there is unrest due to the 68% majority female representation on a board. Is it time I now stand up and declare myself the first Female Champion of Change and follow through with my commitment? Before I race off and resign my post as President of WLAQ I thought I better do a quick check on the stats for Australia as a whole. I cannot start a new position if I am not fully informed on what I need to change. Here is what I found: there is a gender imbalance - and it is not in favour of the males. (Thanks PwC amongst others for all of the research). When I was first called about this, my first thought was 'wow, I am now no longer under 30' and once I was able to overcome the fact that I am now firmly in the next decade, I was able to move to excitement, particularly as the shoot location was getting discussed. Everyone who knows anything about me knows that sport plays a strong role in my life (kind of helps when you have a sports law focused practice!). When I was told that we would be shooting at Suncorp Stadium with the possibility of having shots of me on the pitch, I had to do a happy dance on the spot! I was asked recently why I do what I do; why I mentor, why I am trying to make a change for women in the law and corporate world. To me, I have the ability to try and make a change, so why wouldn't I at least attempt to do something. I want to leave a legacy in this world and if the work I am doing contributes to making a difference for even one female, then I will be over the moon. Thank you to Queensland Business Monthly for including me in the 2017 Top 20 under 40. There's a change coming and I am happy about it! Women's Agenda have recently launched their 'game changer' features and I was stoked to be able to share a bit of insight into my world. I do a lot of speaking, but there a few key parts of my life that I very rarely touch on. I decided to change this slightly, and give a bit more of an insight into my earlier life. I was also able to give some key messages to the corporate world. Watch out because there is change coming and I could not be happier! Thank you to Angela and her team for allowing me to contribute. 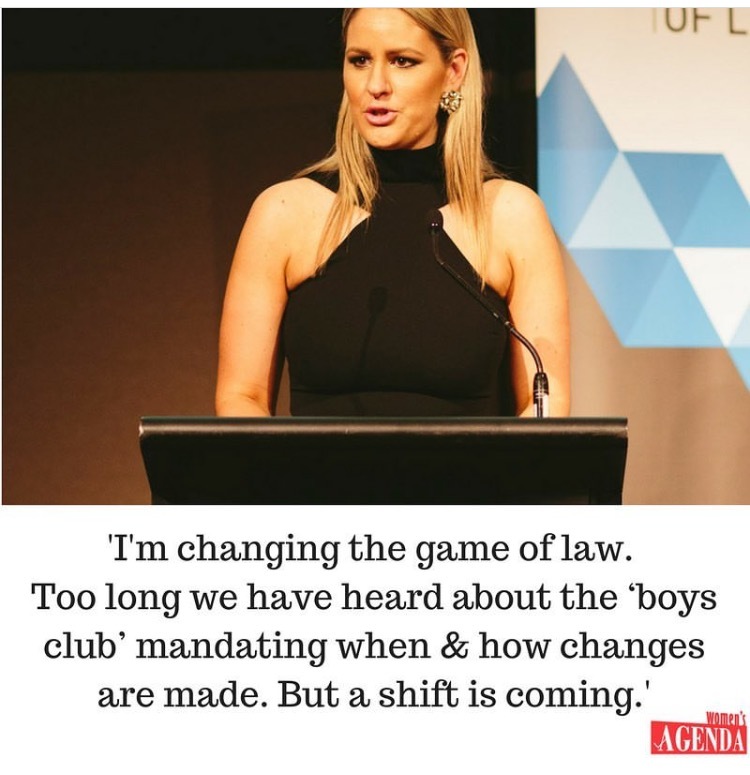 Read more in "Meet the woman changing the game of law". Anyone who has spent a day with me knows that mentoring plays a key part of my life. I frequently have the life of a lawyer chats with junior lawyers where we discuss how their week has been, what they are working on, what they want to work on and checking in on the goals they have set for the year. I will never say no to a request to have a chat and look to develop a mentoring relationship. What I am becoming surprised about is the requests I am receiving which state at first instance 'I want you to be my mentor'. While that is flattering, I don't think it is beneficial to any party to simply state that they have a mentoring relationship. A beneficial mentoring relationship is built over time where a true relationship is formed and both the mentor and mentee work out their common ground and how they can each help each other. Find out about your mentor and what area of business they are in. Jot down some notes about how you think your mentor can help you achieve your goals. Review your career plan and goals to make sure it is up to date to send through to your mentor. Be realistic about timing and expectations. A good mentor is likely busy with a number of other projects, work and life. If they cannot see you for a few weeks, don't become despondent! Show initiative - it is up to you to continue the relationship. Good luck with your mentoring relationship!